I walked around Montrose for a little while this morning. I didn’t see any unusual shorebirds (a Buff-breasted Sandpiper was seen on 8/29) but there was activity around the water feature and Magic Hedge. 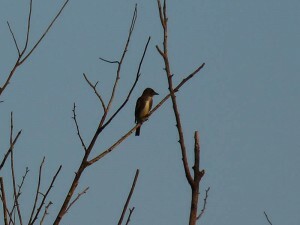 Best was an Olive-sided Flycatcher that moved between the water feature and adjacent Honey Locusts. I also had a Yellow-billed Cuckoo, Eastern Wood-Pewee, Least Flycatcher, Ruby-throated Hummingbird, a couple Swainson’s Thrushes feeding on mulberries in the Magic Hedge, Tennessee Warbler, and American Redstart. This entry was posted in Summer Bird Reports and tagged Cuckoos, Flycatchers, Hummingbirds, Olive-sided Flycatcher, Ruby-throated Hummingbird, Swainson's Thrush, Thrushes, Warblers, Yellow-billed Cuckoo on August 30, 2013 by rhughes. 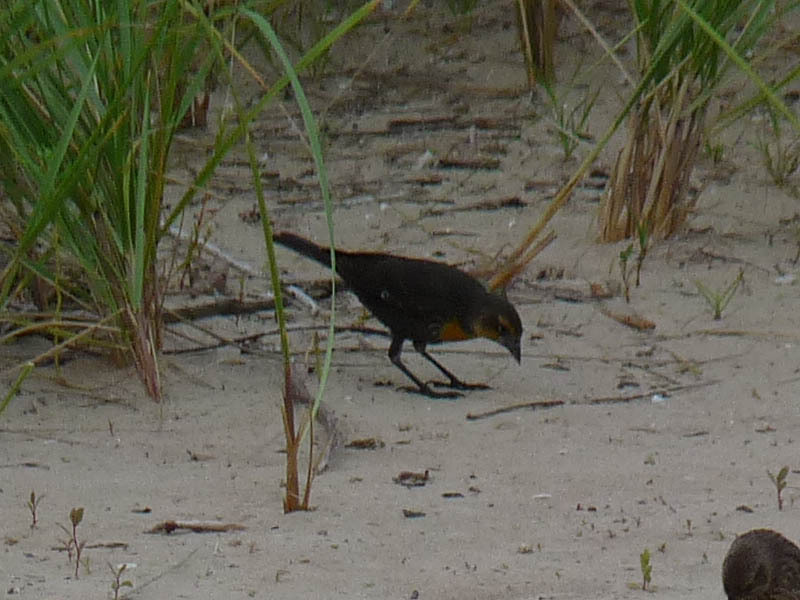 A Yellow-headed Blackbird, probably an immature male, was on the beach inside the protected area at Montrose this morning. Other birds seen at Montrose this a.m. include 2 flyby juvenile Forster’s Terns, 3 Semipalmated Plovers, and a flyover Common Nighthawk. If you go to Montrose at this time of the year I wouldn’t recommend wearing short pants as the flies can be particularly vicious. This entry was posted in Summer Bird Reports and tagged Common Nighthawk, Forster's Tern, Icterids, Nightjars, Terns, Yellow-headed Blackbird on August 27, 2013 by rhughes. Two Whimbrels flew over the east end of Montrose Beach this morning. This was about 6:30. They continued southeast over Lake Michigan and didn’t act like they were going to stop or come back. This is prime time for Whimbrels along Lake Michigan. Other birds seen at Montrose Beach this a.m. include 9 Semipalmated Plovers, 2 Baird’s Sandpipers, a Lesser Yellowlegs, 2 Sanderlings, single Least and Semipalmated Sandpipers, and a group of about 8 Forster’s Terns. I went back out in the afternoon and had a Lark Sparrow in the native planting area near the tower. This was most unexpected as Lark Sparrows are very rare at Montrose in the summer and fall. This entry was posted in Summer Bird Reports and tagged Baird's Sandpiper, Forster's Tern, Lark Sparrow, Shorebirds, Sparrows, Terns, Whimbrel on August 22, 2013 by rhughes. I walked around Montrose this morning for a little while. 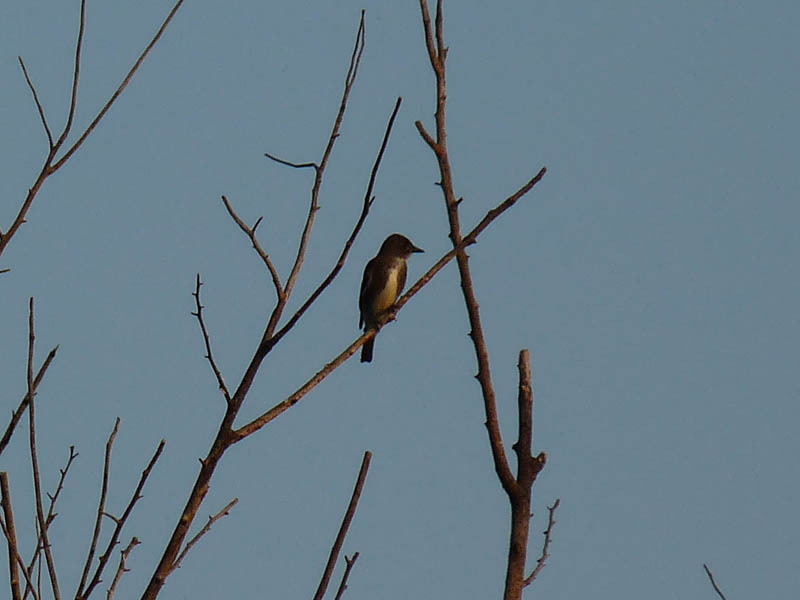 Shorebirds continue to be almost non-existent but I did have a few migrant passerines, including an Orchard Oriole, Least Flycatcher, and Mourning, Black-and-white, and Tennessee Warblers. I’m not sure what’s going on with shorebirds. This is the peak time of the year for them but we’ve had hardly any. This entry was posted in Summer Bird Reports and tagged Icterids, Mourning Warbler, Orchard Oriole, Warblers on August 20, 2013 by rhughes. August 7, 2013 is the ten year anniversary of the Montrose Black-tailed Gull. This is my account of that sighting. Early on the morning of August 7, 2003, Chicago birder Mike Miller was scanning Montrose Beach and noticed an odd dark gull among the local Ring-billed Gulls that had gathered at the west end of the beach. I was standing next to Mike and when I heard him utter the words “There’s a darker backed gull over here” I swung my telescope around to where he was looking and almost immediately saw what looked like an adult Lesser Black-backed Gull. In the back of my mind however I knew this could be the coveted Black-tailed Gull that had been seen as recently as the day before at Miller Beach in Indiana, and several months earlier along the southern Wisconsin lakefront. We were too far away to see the diagnostic red tip to the bill, so with hearts racing and hopes soaring we picked up our scopes and gear and ran over to get a better look at the bird. With closer views the red tipped bill was visible, clinching the identification as a Black-tailed Gull (Larus crassirostris), almost certainly the Black-tailed Gull that had apparently been wandering around Lake Michigan for the past few months. After taking a few dozen photos I made a mental description of the bird: about the same size as a Ring-billed Gull, slaty-gray mantle similar in color to a graellsii Lesser Black-backed Gull (Larus fuscus), yellow legs, yellow bill with a black subterminal band and red tip, and black tail band. Within minutes other birders started to arrive including Montrose regulars Kanae Hirabayashi and John Purcell. I decided that I had enough photos of the bird so I sped home to get word out of the Asian vagrant that was at Montrose Beach. Luckily, the Black-tailed Gull spent several hours at Montrose and, unlike the earlier sightings in Wisconsin and Indiana, was seen by a number of birders. 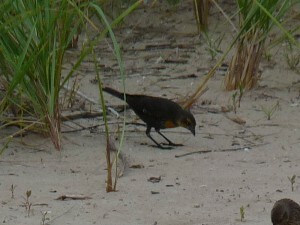 The bird also made the Channel 7 evening news, the Chicago Tribune, and the MSNBC Web site. The Black-tailed Gull is normally found in the western Pacific Ocean around Japan (Harrison 1983). Indeed, one of the common names of this species is Japanese Gull. There are about 11 records for Alaska and another 9 or so for the rest of North America, including sightings as far south as Belize and as far east as Newfoundland, Canada (Lethaby and Bangma 1998). What makes the Chicago Black-tailed Gull significant is that there is only one previous interior North American record of this species, a bird seen in 1987 at Lake Winnepegosis, Manitoba. Clearly this is not a species that is likely to show up in the Midwest. Note: This story appeared in Volume 13, Number 2 of Meadowlark, A Journal of Illinois Birds, the quarterly journal of the Illinois Ornithological Society. Harrison, Peter 1983. Seabirds, An Identification Guide. Houghton Mifflin Company, Boston MA, 448 pp. Lethaby, Nick and Jim Bangma 1998. Identifying Black-tailed Gull in North America. Birding 30 (6): 470-483. This entry was posted in History, Rare Birds, Summer Bird Reports and tagged Black-tailed Gull, Gulls on August 7, 2013 by rhughes.